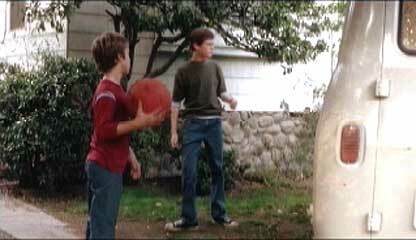 Matthew O’Leary and Jeremy Sumpter wear black and navy blue low cut Converse “Chuck Taylor” All Stars in the film. The Meiks family act as avenging angels on demons in human form. At the opening of Frailty, we are taken to the FBI headquarters in Dallas, Texas late on a dark and stormy night. Senior agent Wesley Doyle (Powers Boothe) has just been called in to meet with a man named Fenton Meiks (Matthew McConaughey) who has come in with a confession about the “God’s Hand” serial murders, a case that Doyle has been investigating. The man claims to have the body of the killer, who he says was his brother, parked outside in a stolen ambulance. As Meiks begins to tell his story, we are taken back in time to 1979 through a series of flashback that takes us to the Meiks household in the small town of Thurman, Texas. Their house is located in the back of the community Rose Garden, and their household consists of their widower dad (Bill Paxton), 10 year old Fenton (Matthew O’Leary), and seven year old Adam (Jeremy Sumpter). Although their mother passed away giving birth to Adam, they have been living a happy and secure existence until one night the two boys are woken up by their dad in the middle of the night. He tells them that he has been visited by an angel who has given him a special assignment on earth: the end of the world is coming, the devil has released demons on the earth in human form, and the Meiks are to seek out these demons and destroy them. The weapons that they use and the list of demons will be revealed to them shortly by the angel. And above all, they must not reveal any of this to outsiders or great harm will come to whoever they tell and to the Meiks themselves. Ordinary days of basketball and play are soon ended by their dad’s mission. 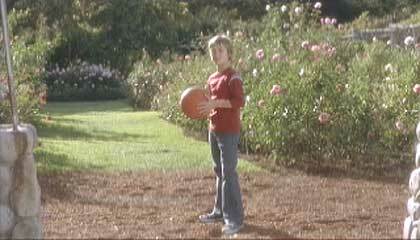 After the killings start, Fenton no longer wants to follow Adam through the Rose Garden. To reveal much more of the story line of Frailty would reduce the impact of it on the viewer. Suffice it to say that the plot continues with the rift that develops between Fenton and his father and there are a number of surprising plot twists toward the end of the film. The story is shocking, upsetting, yet engaging all at the same time. At the end of the film you might not be satisfied, but you have definitely learned something about human nature. Much of this is due to the talents of director/actor Bill Paxton, who has pulled off a disturbing tour-de-force for his directorial debut. In his acting role as Fenton and Adam Meiks’ father, he comes off as a sincere kind of blue-collar dad, not abusive toward his sons and seemingly concerned about their feelings, but morally authoritative in a way that makes you think of other inexplicable crimes that pop up in the news. As a director, Paxton has taken the Hitchcock route, by dealing with the horrific violence mostly off screen, while not backing away from its impact on the principal characters. At the same time, things are treated somewhat matter-of-factly, which in the end only increases the horror, as it makes viewers think a lot more about what they have seen. Much of this is due to the eeriely calm way that Matthew McConaughey narrates the story. For many people, this film will be very upsetting, and it is definitely not a film that you would want younger children to see because some of the experiences that the two kids go through are unconscionable by normal standards of morality. Again credit is due to Paxton for the simple and frank way that the subject matter is handled, and from the fact that there is no convenient Hollywood ending to Frailty. Most upsetting is that the view of Judgement Day presented in Frailty seems not that much different from genocidal events in history like Hitler’s final solution, where seemingly nice middle class people planned the systematic murder of their society’s demons. 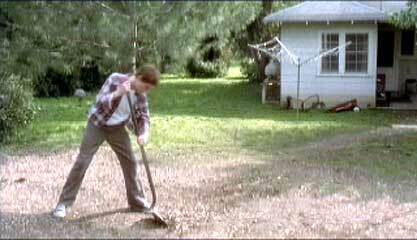 Fenton is ordered to dig a large ditch so that the family can build a cellar to complete their mission. While the narration and story line of Frailty is told through the voices of adults, this story is really about what happens to the Meiks boys. Adam responds to events by believing what his father tells him and accepting the bloodshed and coverup that they entail as a normal part of life. Fenton is old enought to know that this is wrong, and he suffers intensely throught the film, as he balances his loyalty to the only family he has (apparently there are no other close relatives or friends) with his innate sense of morality that continually causes him to try and warn the outside world. Matthew O’Leary gives a brilliant performance as young Fenton; you can see the seething emotions and unbearable pressure constantly on his face as events overwhelm his security and his relationships with his father and brother. Jeremy Sumpter’s portrayal of Adam shows you a side of kids that you would rather not believe is possible, yet you know is true. It’s not one-dimensional; Adam is equally torn between loyalty to his father and his older brother. Even though the story is filled with religious precepts and visions, surprisingly there are no formal religious elements to the film; you never see the family attending church or even discussing the bible. Certainly the way that the film presents religious precepts, especially the role of angels and the hand of God, are controversial and topics of debate. The morality presented in this film reminds you a lot of the mentality you would find in the vigilante American west. Whether or not you think that the story makes sense at the end probably depends on your personal morality, religious beliefs, and ultimately which character you believe. Frailty is a film that will make you think and want to discuss these things. At times the film comes across as a crime drama, then a psychological case study as you try to get into the minds of the Meiks family members, but ultimately it is an American gothic horror film. After Fenton tries to turn his dad in to the authorities, he is locked in the cellar. Fenton’s dad carries him out of the cellar. Michael O’Leary (black) and Jeremy Sumpter (blue) both wear low cut chucks throughout most of their appearances in the film. Although there aren’t many closeups, the chucks remind you of what kids in a normal environment would be wearing so it is even more tragic when you see Adam or Fenton wearing them while digging graves or helping their father exorcise the demons on his list. Fenton stands by one of the “demons”. Frailty. (2001) Bill Paxton, Matthew McConaughey, Powers Boothe, Matthew O’Leary, Jeremy Sumpter. Directed by Bill Paxton. Categories: Drama, Crime and Mystery, Horror.